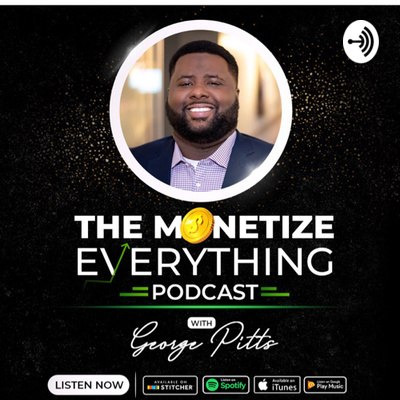 Welcome to The Monetize Everything Podcast. Where we discuss all things Finance. We touch on everything from Personal FInances, Credit, Savings, Business, and much more. Join us as we take your calls and chat with some of the industries best minds in the world of business and finance. In this episode I am going to teach you the benefits and reasoning behind taking action and implementing what you know. You are missing out on thousands maybe even millions of dollars because your not taking action. In this episode I share 5 tips to improve and ignite your Personal Finance journey to build wealth and overcome the spirit of lack. Join me as I discuss the foundation to building an online business in easy to follow steps. What can I invest my money into as a beginner? Join me as we discuss how this athlete gets a $1 Million paycheck every year in July until 2035 and hasnt worked in over 10 years. In this episode we talk about secrets to successful entrepreneurs and how you can incorporate these principles in your life to change everything. In this episode we are going to talk about what is a coach and why everyone should have one. We will dive into the question of what is it that my coach is supposed to do and why should I even hire a coach. Today we discuss the millionaire mindset and how we can adopt these same habits. Changing your mindset is key to any shift your looking for in your life. Join us as we interview Dr Uyi Abraham and Dr Faith Abraham as we discuss business. These two entrepreneur power couple own 12 enterprises and get this they run them both together as one. You don't want to miss this discussion. How to become a power couple in business. Join us as we talk with International Entrepreneur Crisha Bowen. Crisha takes us through her journey of starting her online business in Trinidad and gaining clients all over the world. She has coached and spoke to audiences in multiple countries. What a episode and conversation this one was. Join us as we interview Coach Livi Anderson. She takes us through her journey of being homeless to now making six figures 100% online. She breaks down her struggles and exactly what she did to start and how she has continued to evolve. She also tells us about her biggest purchase after becoming a successful business woman all online. You dont want to miss this.